I design and sew custom tallitot (prayer shawls) and look forward to creating one for you. Write to me at info@customtallit.com about custom designs and about shipping to countries other than the US. Visit http://customtallit.com/ for more information. 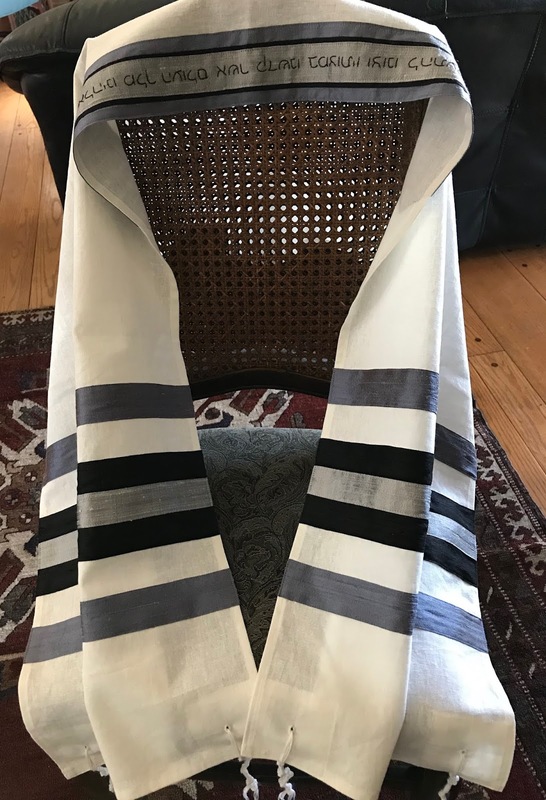 The latest addition to my Online Shop: A tallit of black, silver, and smokey blue stripes against winter-white linen blend. I embroidered the full tallit blessing on the atarah in Hebrew print letters, and I am also making a matching lined, zippered bag of grey cotton with a stripe of black and blue. At 16 x 72 inches, this is a good size for a slim Bar Mitzvah no taller than 5'3. Four shades of blue, from dark royal to very light silvery blue, on midnight navy shantung silk. This one was fun to make. I made one like this for a boy in Michigan four months ago, and this one is going to a girl in Oregon. Pink and peach on off-white dupioni. "Lehit'atef batzitzit" on the atarah. Forest green and pale mint green on pistachio dupioni. Full tallit blessing on the atarah. This tallit is at the same time traditional and modern. Modern because of the simplicity of the four bold stripes; traditional because of the color scheme of royal blue, sky blue, and white. 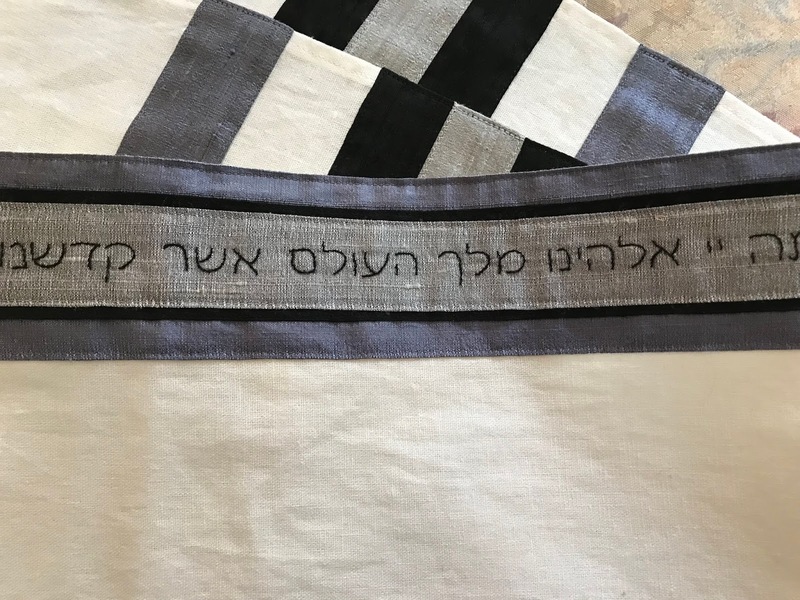 The base fabric is white dupioni silk, and the full tallit blessing is embroidered on the atarah by hand. Available now in my Online Shop. A calm mood in this tallit made of softly gleaming ecru dupioni silk with just a simple stripe of wine and navy. I sometimes think that the simplest designs are the most beautiful, and this one is an example of that kind of thinking. This one is now sold, but another one, with shorter embroidery, is available at my Online Shop. This striking color scheme of blue and purple on bright white was carefully chosen by the Bar Mitzvah boy. His mother tells me it came out just as he had imagined it. The stripe arrangement in this very feminine tallit is a little unusual: Instead of stripes at each end of the tallit, this one features a long band of wine red satin ribbon running the length of the tallit. You might think this was just because I wanted to add interest to the back view (and you would be right), but the reason for that stripe was actually a very practical one. I had two pieces of that winter white dupioni silk, each too narrow to make a tallit. I sewed them together, and then added the ribbon to hide the seam from view! This way I didn't have to throw out two pieces of perfectly good silk, and the end result is kind of nice, I think. I also had some sheer lavender and gold ribbon that made the atarah come alive.